Died at Preston, Lancashire, on Dec. 28th, 1903, Mrs. Ellen Slater, after a life of loyalty to Jesus Christ and of faithfulness to our Church which makes her worthy of a brief memoir in these columns. She was born in 1849, at Withnall, Lancashire, to parents who attended the Church of England. While very young she had the great misfortune to lose her father, and at twelve years of age the perhaps, greater misfortune, to be bereaved of her mother. Possibly these sad experiences of her childhood did much in creating that tenderness of heart which she afterwards showed to the orphaned and the lonely. When fifteen years old she came from her country home to the busy town of Preston, where she could the more readily maintain herself in one of those openings for women so abundant in toiling Lancashire. For a few years she attended the services of the Wesleyan Church where many holy impressions were received. It was reserved, however, for the preachers of our own Church to lead her into the fuller light of acceptance with God. Going to our old Saul Street Sanctuary about the time she came of age she found at once a Saviour and a spiritual home. It was at Saul Street that she met him to whom for many years she proved so great a blessing, and to whom her name now represents so great a loss. On the formation of the Preston Second Station she and her husband joined the Brook Street Society of the new circuit, in time migrating, with that church, to its new temple in Fylde Road. Those were years of usefulness and joy for both husband and wife in which together they earned an esteem which was not denied. Afterwards they united with the cause at Eldon Street, in the Preston Third Circuit. Such were the difficulties and discouragements of this Church that many turned away to less laborious fields. Not so our sister, at Eldon Street she remained until the last, courageously sharing the burdens and making the sacrifices which membership at this place has demanded. The life of our sister was one of these devoid – perhaps happily – of sensational and romantic incident. She had her trials – twice bereavement cast its shadow upon her home as two of her children were gathered to the garden above; but on the whole the tenor of her way was noiseless and calm. Hers was one of those quiet lives in which one day is much as another, and the years bring little more than the ordinary experiences of the home and the Church. Yet it was a life of service – of kindness to the sorrowing, of helpfulness to the poor, of piety and faith and love. Never in any way a “public woman” she nevertheless laboured hard and constantly in the activities of the Church. She loved the gates of Zion. Her joy was in Primitive Methodism – a constant subscriber to its literature, a friend to its ministers, a generous supporter of its funds and constant in her attendance at its ordinances. She was one of those who form the backbone of our Church. 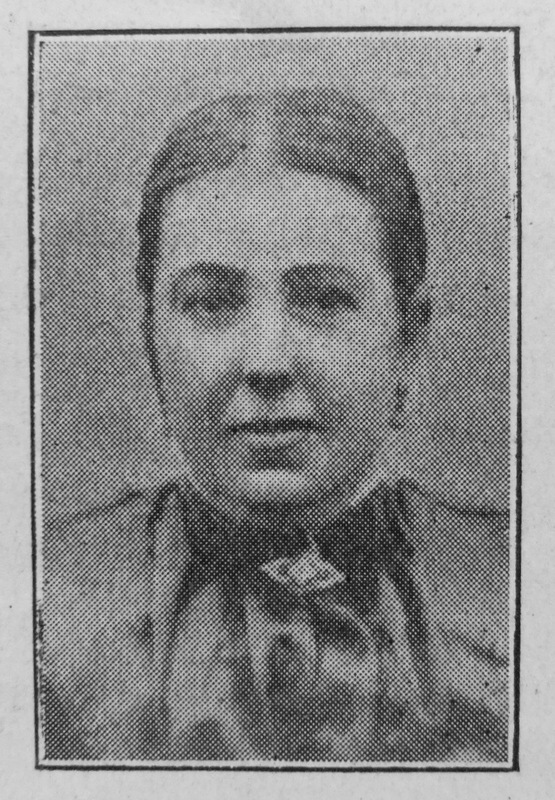 If anything had been needed to prove the esteem in which Ellen Slater was held It would surely have been furnished by the evident sorrow of the large number who followed to her burial and later gathered to Eldon Street Chapel to hear her death improved. This latter task devolved upon the Rev. Joseph Prestwich, her minister, who with the writer officiated at her funeral. She was a good, true woman, and her husband and daughter may well mourn her loss as may many others, the while they remember that after such faith and service her place in heaven is sure. I have not been able to identify Ellen’s parents. Ellen married Robert Slater (abt1846-1915), a cotton loomer, in early 1876 at Preston, Lancashire. Census returns identify one child. Robert married Amanda Fitzallan Seed in late 1909 at Preston.